No matching provisioning profiles found Your build settings specify a provisioning profile with the UUID “BD657D9A-...”, however, no such provisioning profile was found. 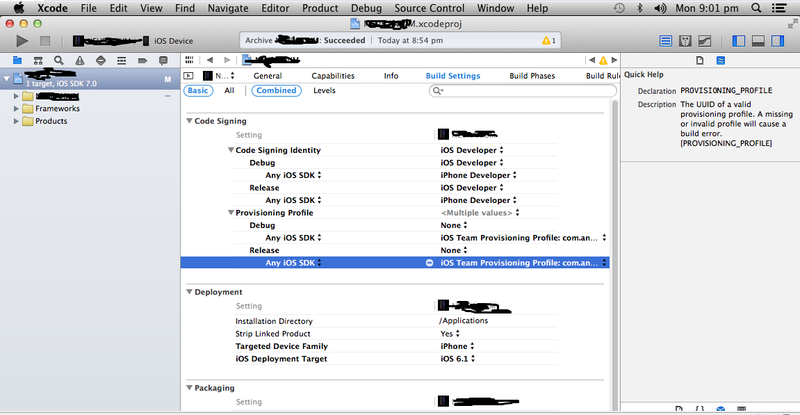 Xcode can resolve this issue by downloading a new provisioning profile from the Member Center. I tried clicking on "Fix Issue" and it still continues to be an error. I removed my certificates from the keychain and downloaded it again through the development portal and that didn't work. I've tried cleaning, rebuilding, closing Xcode, and those all do not work either. I have tried to do different combinations of Code Signing-> Automatic, as well as choosing my debug provisioning profile to be my development profile I just created in the dev portal, and manually choosing the distribution profile I just created in the dev portal as well. Both do not seem to work. Any other troubleshooting tips? Thanks. I'm using XCode 7.2 and saw this problem. Restarting XCode solved this for me. Not sure it will always solve the problem, but you may want to try this first. I know its too late to put an answer here but this question comes up at the top after searching this issue. I managed to solve this by selecting the project and in Build settings changed the UUID options to what I wanted. If you are now using Xcode 7.2, it appears you will receive this message if you download individual profiles either from the Developer Center or from Xcode > Preferences > Account. Select Team Name and View Details > Provisioning Profiles section. I downloaded individual profiles (I've got several dozen so its hard to find a particular one) and was running into this error. Even if you select Download All after downloading individual profiles, this error still comes up. You will need to find the Provisioning Profiles and delete them then select Download All. Easiest way is to right click on a profile in an Account's details that is already downloaded and select Show In Finder and delete them all. Then just select Download All and hopefully your profiles will match up to your Code Signing. I had this issue with Xcode 7.2 and an example I downloaded from a tutorial site, and I tried to run this on my iPhone. 2) under 'General' -> 'Identity' -> Team : select your provisioning profile. You can also update the bundle identifier if needed. this solved the issue for me! Try to use iPhone Configuration Utility and XCode organizer to ensure all certificates/provisions are configured correctly (they should be marked as green ones). Please check if your device is included into certificate/provision on Apple Developer. I updated Xcode7.1 to 7.1.1. Then, solved this problem. I was getting the same error when i tried to archive, tried re-starting XCode, cleaning, rebuilding, nothing worked for a while. Then with the target selected as my project, under General -> Identity -> Bundle identifier, I just deleted and then re-typed the same exact (i know it's silly!) bundle identifier name and then tried to archive again, this time it worked. Such a crazy bug. A lot of people are copying the profiles manually from their "Provisioning Profiles" folder in "~/Library/MobileDevice" with success (including myself). If this works for you, quit copy+pasting and symlink it! # mkdir /Library/MobileDevice; ln -s /Users/myuser/Library/MobileDevice/Provisioning\ Profiles/ /Library/MobileDevice/ -- where myuser is your username. On step 7, xcode requested access to keychain (which it did not do in other solutions stated above), once granted - it worked. Not sure what was going on (my certs and profiles were only 3 months old), and I admit this was a 'brute force' method - but it worked. I did everything that everyone suggested, but none of these fixed my issue. Change the settings to run the app on the simulator. If you have it set to run on a device, and the device udid isn't in the provisioning profile, it will (wrongly) yell at you. Go to your Project > Target > Build settings > Code Signing > Provisioning profile and change it from "Automatic" to select the exact profile you want. At this point, if you haven't changed the app to run on a simulator, an alert might pop up yelling at you to "Fix Issue". DON'T do that! After you manually select your provisioning profile from the list, archive your app. Viola! Not the answer you're looking for? Browse other questions tagged ios iphone xcode code-signing provisioning-profile or ask your own question.